The band rocked. Giuliano photos. 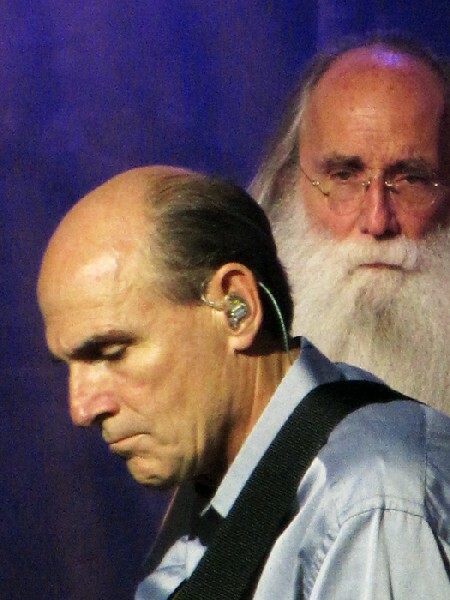 Taylor with bass player Leland Sklar. The earth shakes under her feet. Sing along with Kim Taylor, left, and Kate Markowitz. 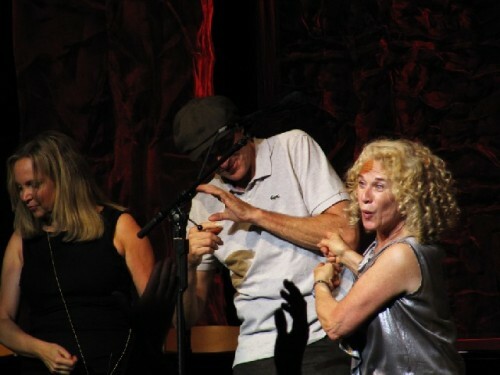 Kim, James and Carole take a bow. The sun, moons and stars all aligned perfectly for a blazingly wonderful Fourth of July weekend in the Berkshires. 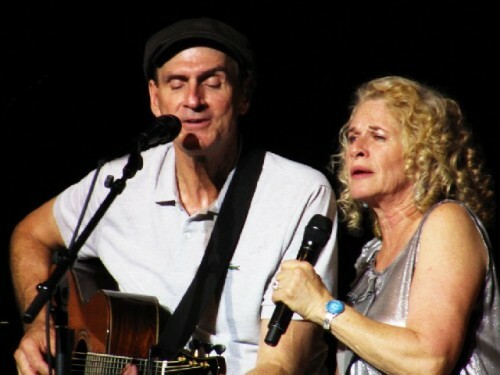 With three sold out shows by James Taylor and Carole King Tanglewood jump started the season drawing some 54,000. Add to that the thin turn out for a Friday night Pops concert and it totaled some 60,000 shuffling through Lenox. The goodies continue tonight with the final concert by the dynamic duo of Taylor and King. This is great news for the arts and tourism in the Berkshires. It is a stunning recovery from the miseries last summer. So far we have had more spectacular days of glorious sunshine than all of last year when it never stopped raining. 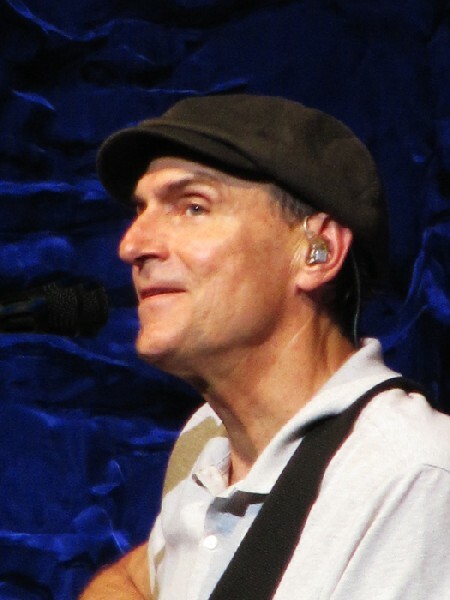 It was a blockbuster series of concerts by Taylor, late in the season of 2009, that saved a lot of restaurants, shops, and hotels from tanking. This year the horse is back in front of the cart to the delight of one and all. In addition to the sold out Tanglewood concerts there was a rich and diverse menu of offerings by world class theatre and dance organizations. Mass MoCA chimed in with a Friday night concert by Richie Havens. During the day visitors had an array of exhibitions to view from Chesterwood, to the Berkshire Museum, Williams College, Norman Rockwell Museum, Degas/ Picasso at the Clark, Petah Coyne at Moca and lots to see at Down Street in North Adams. 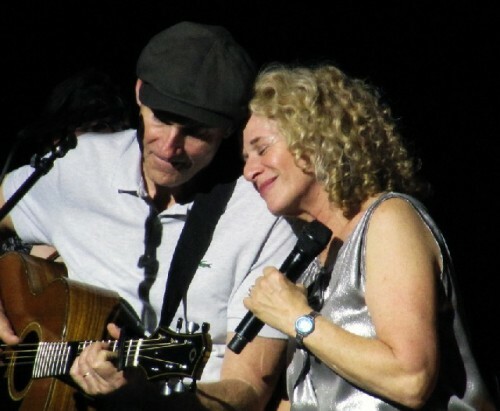 Thank you, thank you, thanks you James and Carole. We attended last night’s concert and loved every delectable morsel of musical heaven under the stars. Well, we were in the shed actually. We toured around the grounds marveling at folks spread out, picnicking and partying as far as the eye could see. Never has the lawn been more densely populated. It was a great reward for all the fans who bought tickets during the dead of winter. The grounds opened at 4 PM and there was a mad dash for the best spots. It seems absurdly early to start a rock concert at 7 PM. But the good folks in Lenox shut it down at 10 PM. That’s why Wilco defected to Mass MoCA this summer. Who ever heard of a rock concert that ended at 10PM. Although the music was followed by another form of fire works. It ensured less of a mad exodus. Simply put James and Carole were divine. For rockers they are senior citizens. Collecting social security. Not that they need it. But they are casual and unassuming about their age and life experience. If anything the depth and quality of their performances have matured and deepened with time. 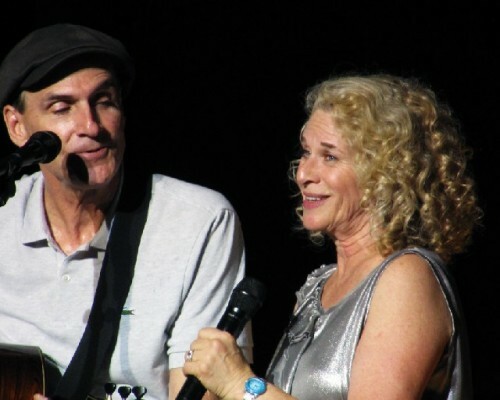 It was clear that James and Carole were having a blast. There were many intimate moments. Lots of hugs and kisses. 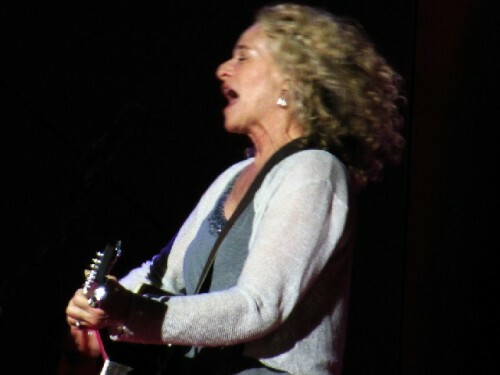 All the more amazing as King, who is now a grandmother, has been writing songs since she was fifteen. For years she and her then husband, Gerry Goffin, labored in NY’s famous Brill Building. They had their first hit “Will You Love Me Tomorrow” for the Shirelles in 1960. 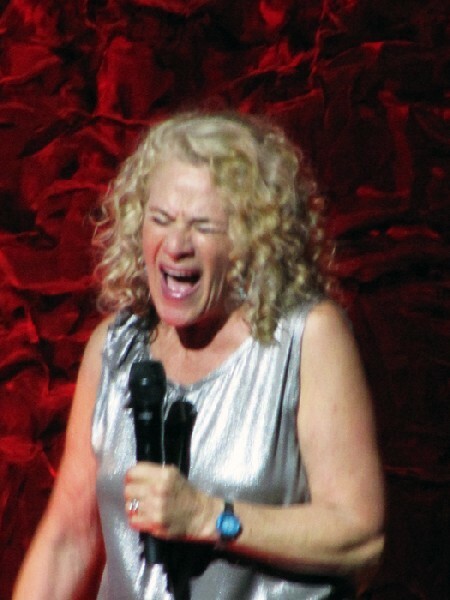 She sang that song last night as well as others from years as a collaborator with Goffin as well as Toni Stern and others. 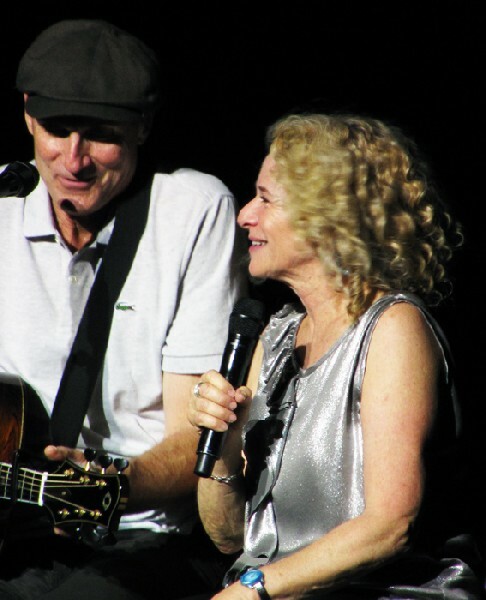 She conveyed to us last night that discovering the singer/ songwriter James Taylor inspired her to write and perform her own music. That led to the album Writer, followed in 1971 by Tapestry, one of the all time chart busting albums. 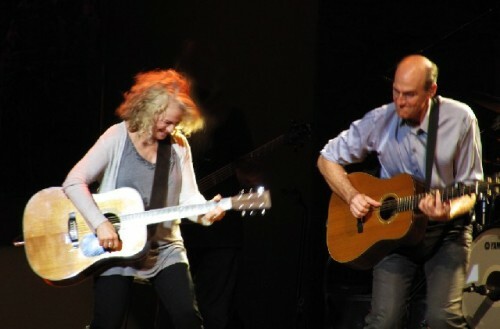 Back then I reviewed her solo concert at the Music Hall in Boston. It was less than impressive. She seemed shy and self conscious. 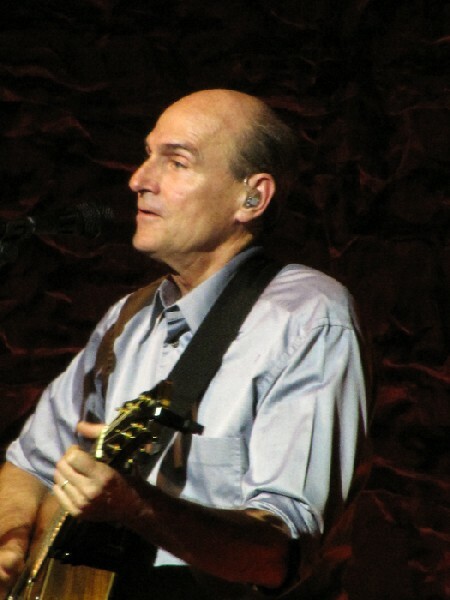 The audience clapped and chanted but King did not return for encores. It was brief and disappointing. 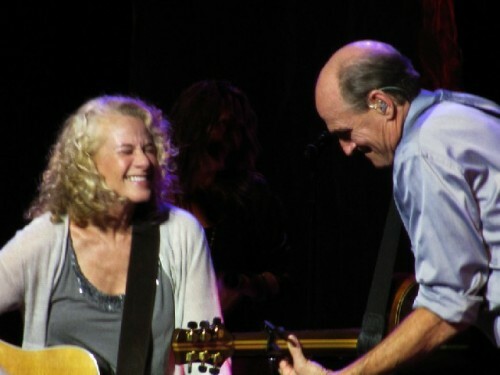 On another occasion, at the old Boston Garden, she appeared with James Taylor. She seemed more comfortable in a supporting role. 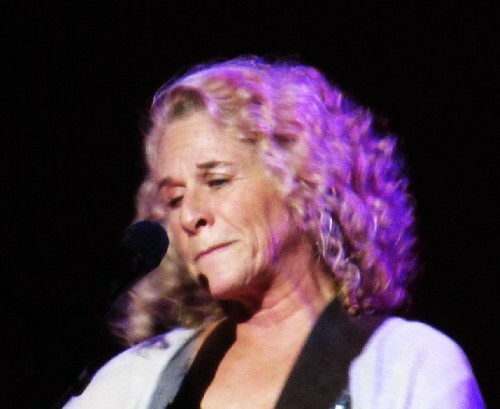 Last night it was evident she has moved with warp speed and light years from those insecure origins as a performer. Compared to the mellow and laid back JT she was all over the place. Some of the most spectacular moments, of many, of the evening occurred when King belted out anthems like “I Feel the Earth Move Under My Feet” or the gut wrenching “You Make Me Fell Like a Natural Woman.” It was every bit as deeply felt and shattering as the original cover by Aretha Franklin. She has recaptured her best material. Much of the evening King was barely visible behind the Yamaha Grand Piano. 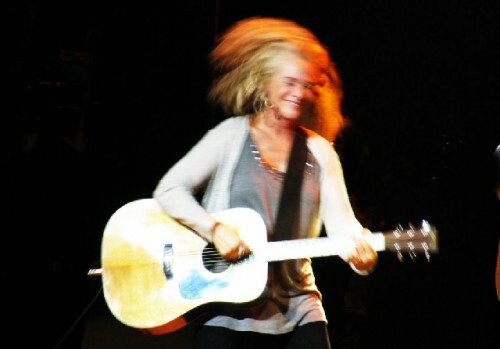 We saw a sliver of her head as she knocked out duets with JT. Wisely they got her out from behind the piano. There were intervals where she just came forward and sang standup. 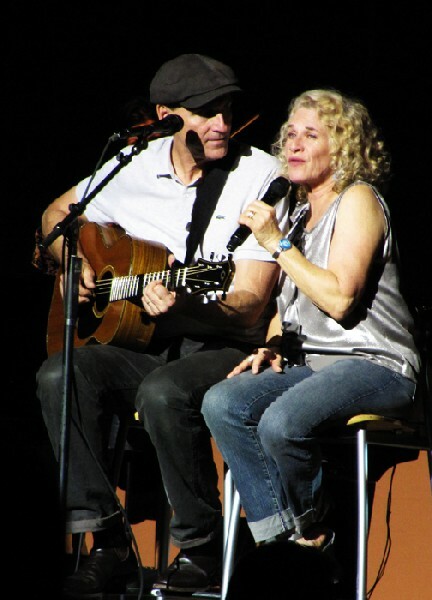 At other times there were cozy duets with Taylor. They sat on stools. 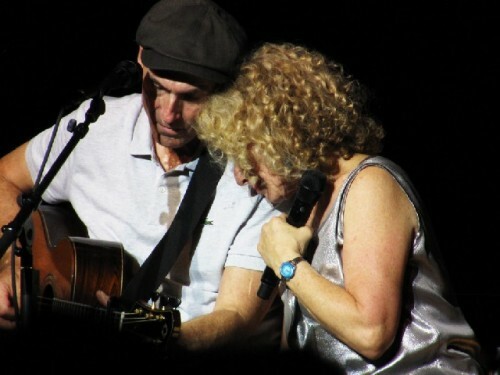 During tender interludes she rested her head on his shoulder. From time to time they embraced. It was a very emotional performance for them as well as for us. They have been doing this since March in Australia. The tour is winding down later this month. For a few days Taylor is sleeping in his own bed. Always nice to be back home. Like the line about the highway from “Stockbridge to Boston” in Taylor’s iconic “Fire and Rain.” There was a mighty roar from the 18,000 at the Berkshire reference. You had to feel that there was something really special about last night. Like a team playing a home game after too much time on the road. Everyone always plays better on their own turf. In front of friends and family. 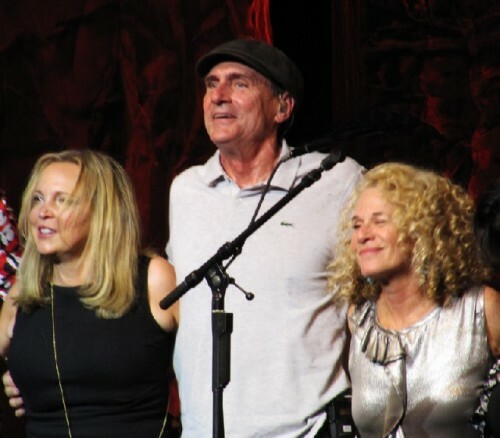 Taylor and his wife Kim, who made cameo appearances as a backup singer, have become very special friends of Tanglewood. Last night’s performance was a benefit. In this tough economy that is all the more appreciated. Also, from the stage Taylor urged the audience to return for more concerts during the season. During their tour Taylor and King have raised $1.5 million for their favorite charities. 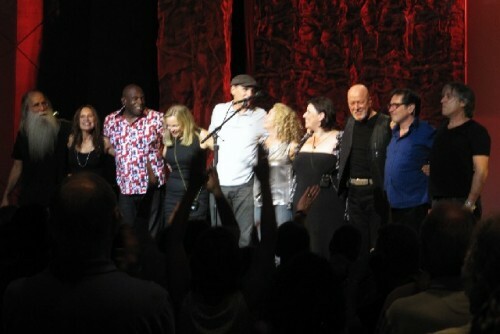 Not counting last’s nights benefit for Tanglewood. As the lyrics of the song say “You’ve Got a Friend.” The song was a King original that became a hit for Taylor. It was delightful to hear it as a duet. 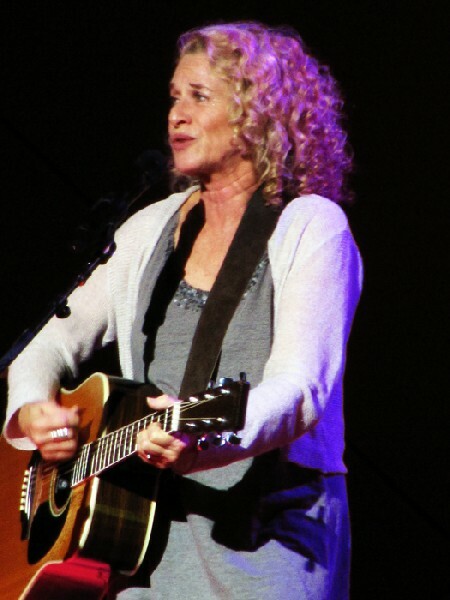 The almost three hour evening, with an intermission, alternated between their hits. It was evenly paced. There were solos as well as duets. At times they backed each other. 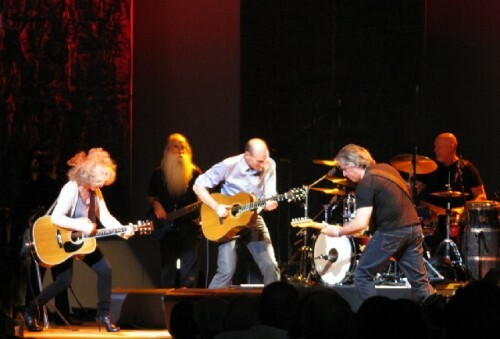 The premise is that this is a reunion of when they first performed decades ago at the Troubadour in Los Angeles. They have brought together the original band; guitarist, Danny “Kooch” Kortchmar, percussionist, Russ Kunkel, and bass player, Leland Sklar. A new member of the band is King’s son in law, Robbie Kondor. He took over the piano when she came out front. Kondor also played synthesizers and harmonica. After an intermission the second set flew by in a blur. The energy level intensified as they blasted out some of their greatest hits. The range and nuance of mood from belters to ballads was remarkable. Because people were drifting back to their seats the first couple of songs of the second set were squandered. There was an interesting mix of anthems and covers. 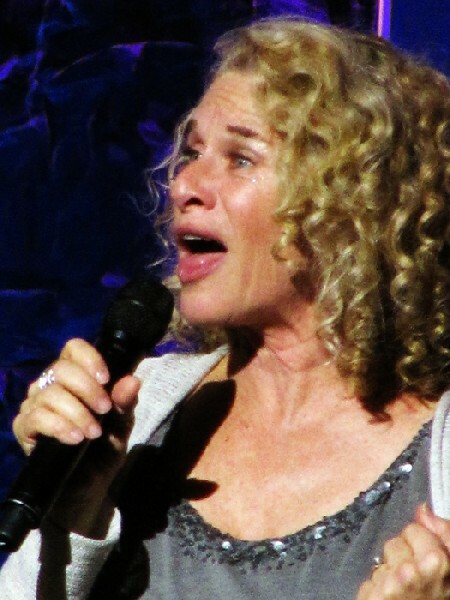 It was interesting to hear her version of “Crying in the Rain” which was a hit for the Everly Brothers. As well as “Chains” which was first recorded by the Cookies and then that other group, The Beatles. 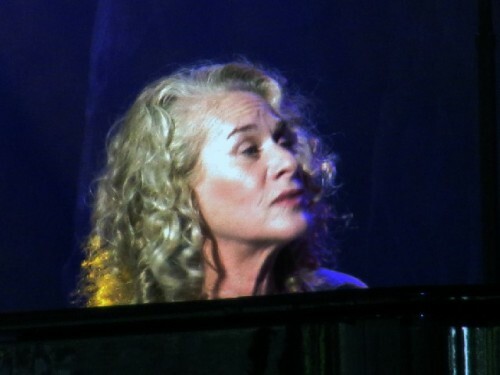 From 1974 she sang “Jazz Man.” Of course JT crooned “Sweet Baby James.” She came back with “It’s Too Late.” Then that wonderful duet of “You’ve Got a Friend” which was the theme of the evening. The audience wouldn’t let them go. There was frenetic stomping for more. Fans tried to move closer to the stage. The aisles were clogged. Smiles on all of our faces. It was the kind of evening you want never to end. 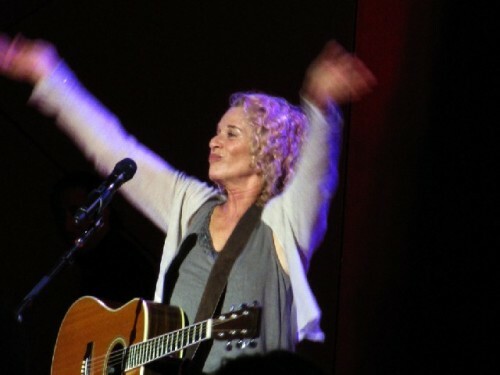 Carole raised her arm with a single finger extended. It signified our wish, please, oh please, oh pretty please, one more. They soothed our heat and passion with the introspective “Close Your Eyes.” It was the refreshing and thoughtful serving of sorbet that sent us off into the night. "Just got back from opening excercises at Ozawa Hall! Great Spanish-influenced program with De Burgos conducting, absolutely perfect for a bright, hot afternoon. It's really amusing to "reverse commute" to Tanglewood; the appeal of the Pops & 70's pop programming continues to elude me. " "
"Loved Taylor King Review. Almost as good as being there. Still, I do wish I was there. I am in Santa Fe and Taos till Sunday the 11th having a great time. 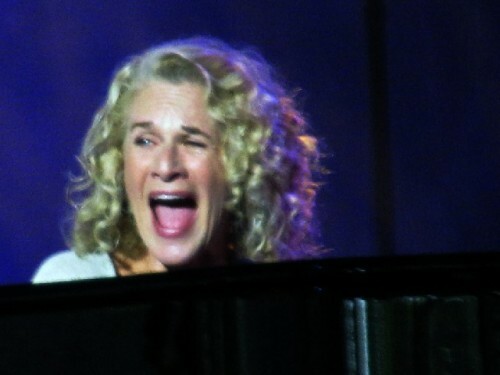 Oh Yeah, I went to high school with Carole Klein AKA Carole King. Great Gal! Enjoy the summer, Eddy"